Aqua Standard is designed as a general purpose, great value on board PC. 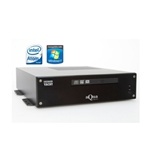 For on-board entertainment the AquaMedia PC is the solution. AquaNav is a PC system designed specifically for electronic navigation and electronic charting. AquaPro is designed specifically for high speed, demanding 3D charting and bathy-metric applications.